JEAM is now indexed by Emerging Sources Citation Indexing (ESCI) in Web of Science™ Core Database, Scopus, CNKI, and ResearchGate! This peer-reviewed journal publishes original research results in the field of environmental and ecological science with focus on applications to the sustainable management of natural, human-dominated, and man-made ecosystems. 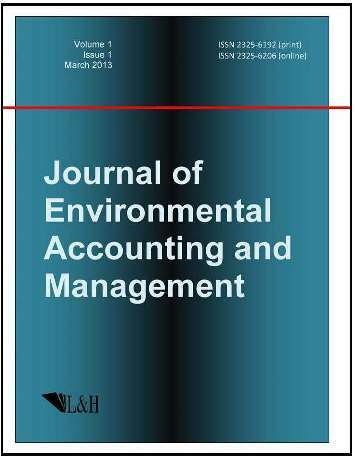 The aim of the journal is to provide a place for a rapid exchange of new ideas and concepts for scientists and engineers in the fields of environmental accounting, human and systems ecology, and environmental management. Manuscripts on environmental accounting and managements are solicited, including: mathematical modeling; computational and management techniques in environmental, ecological, energy and information science; environmental technology and engineering; human managed ecosystems such as agricultural, urban, coastal, riparian, and wetland ecosystems. Manuscripts dealing with purely economic and financial topics, without investigation of the related environmental aspects, will not be considered for publication. No length limitations for contributions are set, but only concisely written manuscripts are considered for publication. Brief papers can be published on the basis of Technical Notes. Discussions of previous published papers are welcome. Environmental and ecological economics, environmental accounting, environmental impact assessment, ecosystem service assessment, energy and resource use, social factors and management. Modeling in environmental conservation and restoration, eco-hydrology and water resources management, ecological process and pattern, climate change effects, environmental engineering and technology. Planning and management in human dimension-institutions and patterns for socio-economic systems, industrial ecology, ecological informatics, landscape design, and urban planning. Environmental policy, legislation, and innovations with environmental and strategic impact assessment, project appraisal and auditing, and environmental protection.